Hello Manhattan! 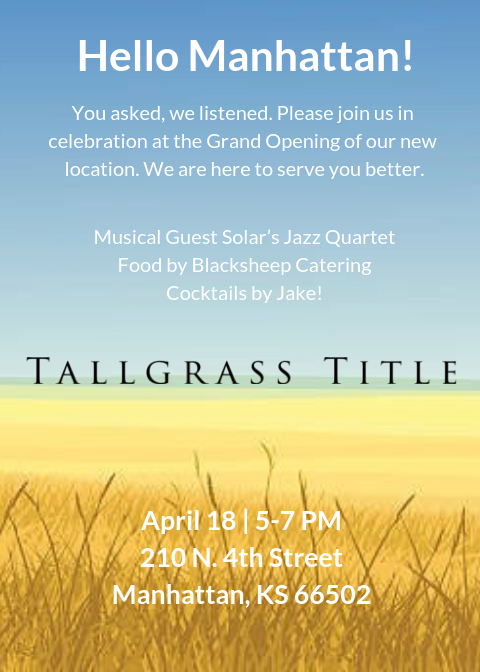 Please join us at the grand opening of the Manhattan office of Tallgrass Title. We are having a reception at our location in the Hartford Building on April 18 from 5 to 7 p.m. and we’d like for you to attend. Local group, Solar’s Jazz Quartet will be delivering musical treats for your ears. Amazing food will be provided by Blacksheep Catering and Jake will being offering specialty cocktails. We’ve heard from many of our customers they’d like for us to open an office in Manhattan, and as your newest neighbors, we want to hear how we can best serve you. We are excited to see you at our event so that we may learn more about your needs as a real estate professional. The event will be held at our new office located in the Hartford Building located at 210 N. 4th. Come out and eat, drink and say hello! Please save the date! 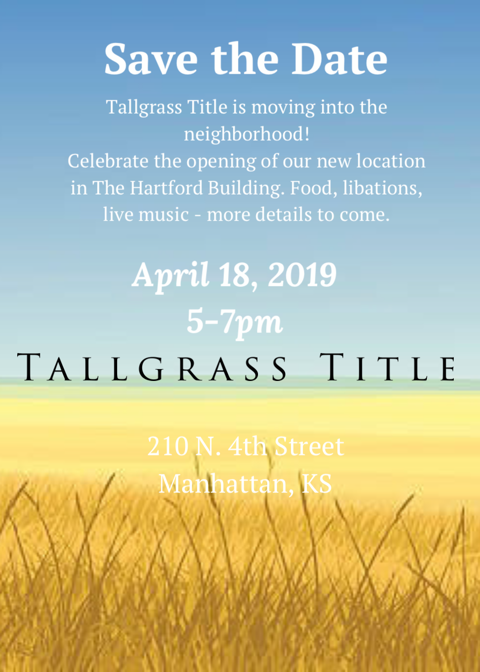 Tallgrass Title is opening a new office in Manhattan, and we’re hosting a bash at the Hartford Building on April 18 from 5 to 7 p.m. that we’d like for you to attend. At Tallgrass Title we know how to throw a great party, so expect more than a typical grand opening. We are excited to meet you and learn more about your needs as a real estate professional. We’ve heard from many of our customers they’d like for us to open an office in Manhattan, and as your newest neighbors, we want to hear how we can best serve you. In the coming days, look for updates and an invite containing details regarding food, cocktails and music. New Year, No More Mortgage Registration Tax! In Kansas in years past, mortgage registration tax was charged by the State of Kansas for the filing of a mortgage at the county register of deed’s office. This tax was based upon the size of the mortgage and had to be paid at the time of filing the mortgage. In the last year of its existence, a residential mortgage in the amount of $100,000 would result in a tax in the amount of $50.00. As you can see, this amount can quickly multiply on larger mortgages. Additionally, a filing fee based upon the number of pages to be filed was charged along with the mortgage registration tax. A standard, thirty-year mortgage typically results in a filing fee of anywhere from $100.00 to $350.00. These fees will typically show up as financing charges or “closing costs” on a settlement statement. In my experience, most individuals were not aware of the fees until they reviewed their closing statements. It was usually a shock for buyers to learn that they had to pay a couple hundred dollars simply to file a document at the register of deeds. A few years ago, several homeowner, realtor and homebuilding groups lobbied State Legislators for the repeal of the mortgage registration tax. Their efforts were successful, and the tax was phased out over a few years until now. Beginning on January 1, 2019, mortgage registration tax is no longer charged in Kansas. This means immediate savings for homebuyers and homeowners that are refinancing their existing loans. 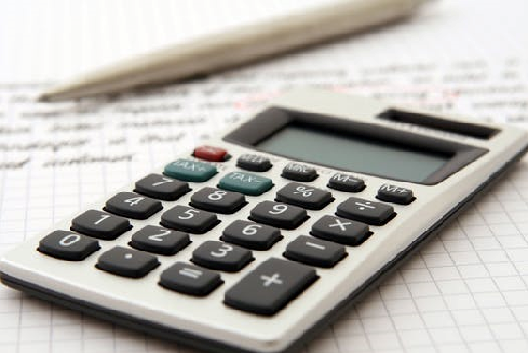 Additionally, the filing fees charged at the register of deeds will not increase in 2019. Again, this is helpful to the Kansas home buyer and homeowner. Should you have any questions regarding the repeal of the mortgage registration tax or the current filing fees, feel free to contact Tallgrass Title. We realize that many of you will probably not have to take a document to the county Register of Deeds Office. However, it is still helpful to know a little bit about the requirements. It makes filling out and completing the deed packet and other documents necessary for closing much easier. Don’t change the formatting of a deed or other notarized document. Let’s face it, technology is complicated. Your computer or printer might try to change the margins, font, font size, or spacing. Why is that a big deal? It is the duty of the Register of Deeds to keep the real estate records legible and clear. In order to do this, there are strict guidelines to help make that happen. One of the rules is the size of the font. If the wording is too small, the documents can’t be scanned correctly into the archives. 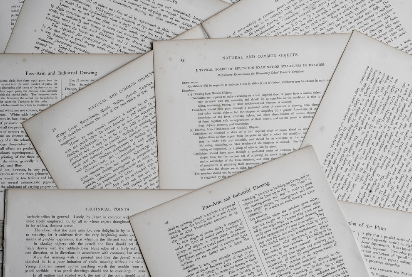 There are also rules in place about document margins. There needs to be plenty of space at the top for the filing information, as well as enough space on the sides so no information will be cut off. If your printer likes to cut off the top or bottom of a legal-sized document, you run the risk of losing important information. For example, part of a legal description or a signature line could be left out. Also, it is very important to print the documents single-sided, not double-sided. 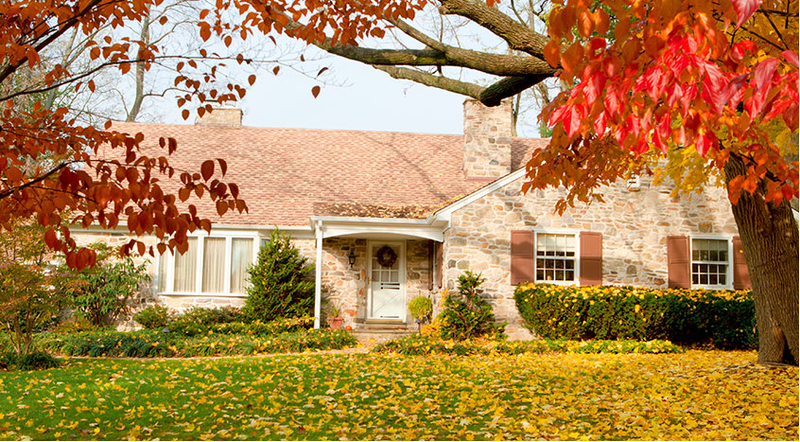 When will the recorded original deed be given back to the buyers after closing? This is a question we get asked on a regular basis. The answer? Usually within 30-60 days following a closing, we send out the recorded original documents with the Title Insurance Policy. Unfortunately, we cannot just pull out a magic number that fits all cases. This is because we have to wait until the commitment requirements have been met. For example, some banks take a bit more time than others to file mortgage releases. Rest assured though, that we will work to send out the policy and documents just as soon as we possibly can. Here at Tallgrass Title it is our goal to help you successfully complete your real estate transaction as smoothly as possible. Reach out to us to let us know how we can help you make it happen! Easements to real estate are simply an interest in some other person’s land for the limited purpose identified in the easement. In plain language, it is the right of another person to use your land for some limited purpose. Easements can be exclusive; meaning that the use is restricted to a certain person or persons. Easements can also be limited to a certain amount of time or can be perpetual and “run with the land.” As there are countless different variations of easements, it is impossible to explain all the law surrounding easements. The purpose of this post is to point out two of the most common types of easements and give a brief overview of common issues. Some of the most common forms of easements are travel easements and utility easements. A travel easement is the right for another individual to cross real estate not owned by them. Usually this is for the purpose of accessing their own real estate. Commonly, a travel easement (otherwise known as “ingress-egress” easement) is granted to a homeowner who owns real estate that is only accessible by crossing another person’s land. With agricultural real estate, a travel easement is typically given to a farmer so that they may access their field or pasture as there is no direct access from a road. Most of these types of travel easements are perpetual or “run with the land.” This means that if the owner of the easement sells their real estate that is accessed by the easement, the new owner will have the right to continue to use the easement. 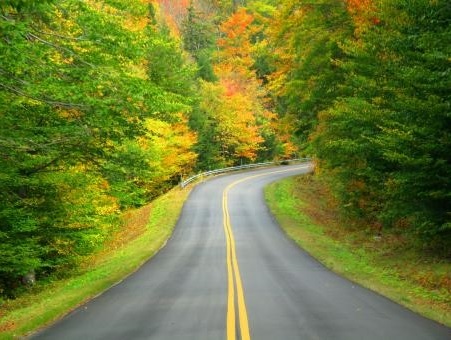 When representing buyers of real estate, if there is not apparent direct access from a government roadway, it is wise to inquire as to whether there is a travel easement and whether it transfers to your buyers. Nobody wants to purchase real estate only to find out they cannot access it! The other major type of easement is a utility easement. Based upon reading the first portion of this post, it should come as no surprise that a utility easement is simply the right to cross another person’s real estate with utilities. These types of easements range from a small water line running to a house all the way to high voltage transmission lines. The most important thing to take into consideration with utility easements is whether the easement will affect the planned use of a potential buyer. Utility easements commonly do not allow a person to build any structure over or under an easement. For example, if a Buyer had plans to build a garage, the location of an easement could affect these plans. An easy way to determine whether there are easements on real estate being purchased or sold is to review the title commitment. This report should list all easements that are affecting the real estate being transferred. The easements will be listed under the “exceptions” section or following the legal description. Often the commitment will only list the existence of the easement and not specify the details. At Tallgrass Title, we happily supply the underlying document listed in our commitments upon request. That’s our job! In the state of Kansas, real estate taxes are paid in arrears. This means that the taxes for 2018 are not payable until the end of 2018. The county issues the tax statements in the beginning of November each year. The 1st half is due on December 20th and the 2nd half the following May. How does this affect real estate sales? As soon as the new tax statement is available at the county treasurer’s office in November, we obtain a copy of it. For all closings that happen between early November through the end of May, our closing agents ensure that the taxes are paid in full during closing. The only exception to this rule is when the Lender will pay the taxes directly out of the escrow account. For example, if a closing happens in February, the seller will pay the 2nd half taxes during closing, even though technically they are not due until May. In most counties, the new owners will not receive a 2nd half tax statement. So, it would be very easy to forget to pay the 2nd half in May. The treasurer’s office would think that the previous owners are responsible and send notices to them. However, the previous owners have already given a credit to the new owners to pay the bill (through the tax proration), so they actually aren’t responsible. As you can see, this can cause a lot of unnecessary stress on all the parties. If there is an escrow account with the Lender, the taxes usually will be paid from it. The tax proration is a credit to the buyer for taxes that will come due in the future. We cannot be sure exactly how much the new taxes will be until the county tells us in November. But they usually are close to the amount due last year unless there was a building project. Realtors or buyers can always call our closing agents to ask questions. It doesn’t matter how many months ago the closing happened. We are happy to help you find the answers! Our job as a title insurance provider is to insure the parties are passing clear title to the real estate. We perform an in-depth search of the real estate to prove that. 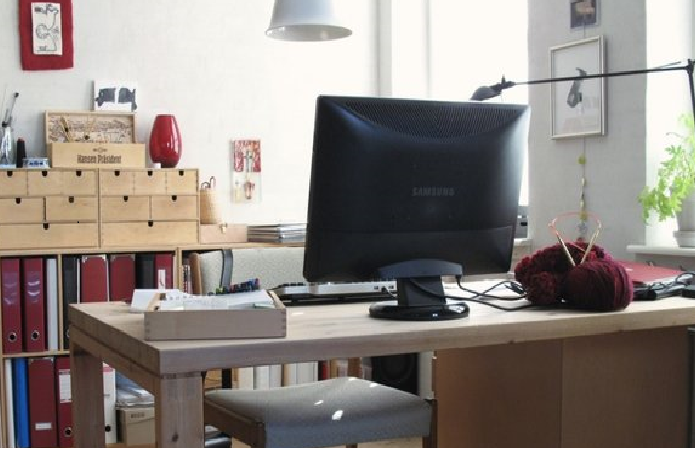 We also perform a judgment search on both sellers and buyers. We check for court cases filed against each party and any liens that have been filed against the real estate. If we find any open matters that need to be resolved, we add requirements to the commitment. Once the required documents are provided to us, we can clear the lien from the real estate. If a divorce has been filed by one (or more) of the parties, there may be a court order for child support or spousal maintenance. The title insurance commitment will list a requirement for proof that the payments are current. In some cases, the real estate taxes may be delinquent. When this happens, the delinquent taxes must be paid off during closing. The seller can certainly pay the taxes before closing, but we are usually asked to pay them off out of the seller’s proceeds. We obtain a payoff statement from the county treasurer’s office and add the total payoff amount to the settlement statement. If the seller chooses to pay the back taxes early, we will update the commitment as soon as we receive proof of payment. Contractors who do certain types of repairs or improvements have a period of time to file a lien. For example, if a homeowner doesn’t pay a bill for their driveway being paved, the buyers could be stuck with paying it. The unpaid contractor has up to a few months to file a lien at the county. This is why we have each seller sign the Affidavit of Debts and Liens. By doing so, they are swearing that there are no other outstanding debts that could attach to the real estate. If there has been a civil case filed against one of the parties, we have one of our attorneys review the documents to be sure it will not attach to the real estate. We may require additional documents or a payoff in order to release the suit. Here at Tallgrass Title we understand that each real estate transaction has unique twists. Feel free to call or email if you have any questions about your transactions. As always, we are here to help! Most of you have probably been in the real estate world long enough to know what title insurance is. However, we thought it would be helpful to provide a “refresher” course to help answer your client’s questions. Let’s face it, most people closing on real estate don’t read through the details of all of their closing documents. However, there are people who look at the settlement statement and want to know what they are paying for. Also, suppose you have clients who are keeping a close eye on finances. If they want to save some money, they might ask if title insurance is necessary. Here are some pointers to help out your clients, or those professionals who are still new to the real estate world. This is the simplest definition of title insurance. A title insurance policy insures that the property owner actually has full title to the real estate. When a real estate legal description or address is brought to us, we start an extensive search. Our search follows the “chain of title”, the deeds that show how the real estate changed hands over the years. Any mortgages filed against that real estate must have been properly released. Not only do we look at the records for that tract of real estate, but we also look for judgments against the buyers and sellers. We look for any law suits or claims that could potentially attach to the real estate as liens. Title Insurance brings peace of mind. The title commitment is our promise to issue a title insurance policy once the requirements have been met. The title insurance policy is issued after closing, once the deed and mortgage have been filed, and the liens properly released. Once the new property owners receive their policy, they can be assured that they truly own their real estate. If a claim is made by someone challenging their ownership, they have the policy to back them up. Here at Tallgrass Title we work hard to provide the information and assistance everyone needs for a smooth closing. Feel free to contact one of our agents today to help get your real estate questions answered.